Number 4 on my list of Frankenstein Events in 2007: John Lauritsen’s The Man Who Wrote Frankenstein. It’s an old story. From the moment it was published, anonymously, 190 years ago, critics attributed Frankenstein to the author of the book’s original introduction, Percy Bysshe Shelley. Even after Mary assumed her byline, Percy’s presence loomed as her editor, some said collaborator, in the authorship of the famous novel. To this day, scholars are still measuring Percy’s influence on the novel, chiefly through the study of his numerous annotations to Mary’s manuscript. In March of 2007, writer John Lauritsen revived the controversy and cranked it up to eleven. 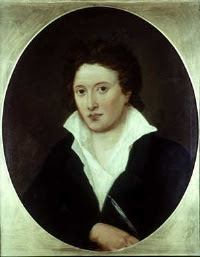 Lauritsen argues that Frankenstein was written by Percy Bysshe Shelley, not Mary, whose contribution was basically secretarial, copying Percy’s work in her own handwriting as she had done for some of Lord Byron’s poems, preparing the manuscript for the printer. 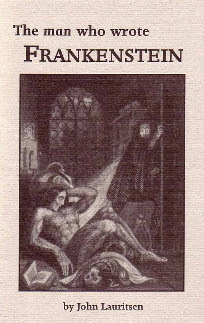 Lauritsen also suggests that the central theme of Frankenstein is male love, expressed both directly and in coded language that he, as a gay historian, is able to interpret. Lauritsen’s forceful thesis, self-published under his Pagan Press imprint with the unmistakable title of The Man Who Wrote Frankenstein, ignited a firestorm in literary circles. It went ballistic, reaching a wider audience after Camille Paglia gave the book a short but resoundingly positive review in a Salon.com article. A vastly different perspective on the book came from Germaine Greer whose article in The Guardian carried its own unequivocal title, “Yes, Frankenstein really was written by Mary Shelley. It's obvious - because the book is so bad”. John Lauritsen’s website is here. Pagan Press is here, including a list of reviews, notably Camille Paglia’s, and Pagan Press' Frankenstein pages. Germaine Greer’s article in The Guardian. Transcript from ABC Radio’s The Book Show. If you are interested in Lauritsen’s book, The Man Who Wrote Frankenstein, I suggest getting it directly from the author. Support small-press publishers! The Frankenstein Events of 2007 Countdown continues on Wednesday, December 26. Thank you for bringing this to wider attention! Amazing stuff! 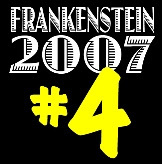 Frankensteinia is one of the smartest cool blogs in vast blogosphere! I think Lauritsen overreaches, but I'll have to get the book and investigate further. Really enjoyed this post and the evenhanded way in which you tackled the subject. I've been wanting Lauritsen's book for awhile so hopefully I can pick it up soon. Your Frankenstein event countdown is terrific! I uncovered this blog entry while having a Facebook discussion about it. As it stands, this is a great post in its own right.